Gasoline is widely used as a fuel for cars. Gasoline (also called Petrol in Europe) is a complex mixture of a number of hydrocarbon fractions produced from the refining of crude oil , which has to fulfil a large number of specifications. In most cases, additives are added to improve the quality of the gasoline and to ensure that gasoline specifications are met. The diagram below shows a typical product yield from a refinery processing a barrel of crude oil. The fraction that is separated from crude oil via distillation, called virgin or straight-run petrol or naphtha, has an octane number of around 70 and thus requires the addition of other materials in order to be suitable for use in modern engines. 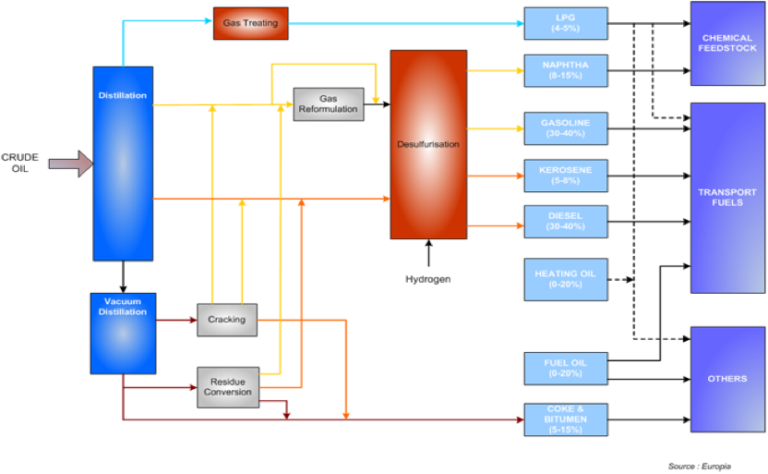 The blending together of the various refinery streams to achieve the desired characteristics is a highly complex process involving sophisticated computer programmes. A modern petrol is often a blend of nine or more components.